Just when I think I have a great way to describe a record and how they fit into the scene they were born from, 9 times out of 10 allmusic has beat me to the punch. I scored the first SRC record (and yes, finding good records is what I imagine drug addicts feel like when they buy really good drugs so scored is the proper word here) a few weeks ago and finally got around to listening to it. Now I understand why my friends at the record shook their heads at me when I brought it to the register as if to say you of all people should have owned this record already. The truth hurts. 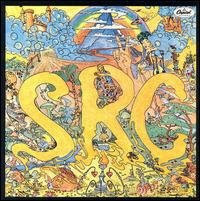 With the twin leads of Gary Quackenbush and Steve Lyman, the distinctly church-like psychedelic Hammond of Glenn Quackenbush, and the angelic (and anglophile) vocals of Scott Richardson, SRC is a distinctly acidic album unlike anything else from the Detroit scene — there's not a single soul influence to be heard! Instead, ideas were formed from Procol Harum, the Pretty Things, the Who, and blended with the beauty of the Left Banke. "Black Sheep," "Daystar," and "Marionette" are highlights of this distinct album of cosmic psychedelia and melodic childlike pop. It even sounds fresh today. The only two cents I will add here is the vocals really remind me of the Zombies in the way they sound as innocent as a boy from a church choir which works in magnificent irony against seething heavy psych guitar solos. So many records, so little time. I'm older than you and only heard this within the past year, played in my presence by our mutual friend who is older still and was recently initiated as well. Back to watching Roller Boogie on TCM.